Planning outrage doesn’t happen only in Wandsworth, and here is an example of developers’ cow-boys hand-in-glove with Lambeth Council . How would you feel if you were violently SHAKEN awake at 06:30 one cold December morning to find your home trembling uncontrollably?! “We thought we were in the middle of an earthquake… My whole body was shaking right through to my teeth… the constant movement of our houses and pneumatic drilling sounds made it too unbearable for us to stay home during the day”. It wasn’t an earthquake but large monstrous diggers furiously tunnelling 12 foot deep trenches inches away from their back garden walls belonging to a small Streatham Hill community. 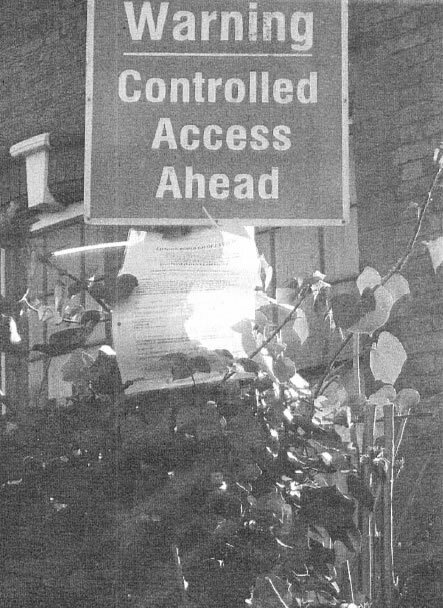 Hambridge Homes aka Greennow owned by father and son duo Michael and James Overton hadn’t bothered serving party wall notices, claiming they weren’t building close enough to our homes to warrant this. A complete untruth as the complete collapse of 3 brick garden walls showed as well as the photographs we took. And things got progressively worse. Both Hambridge Homes and Lambeth council continually disregarded their legal statutory rights and treated them with disdain, disrespect, quite frankly like something they’d stepped in by accident. The most recent SMACK in the face delivered to them by the Overtons came a few weeks ago. 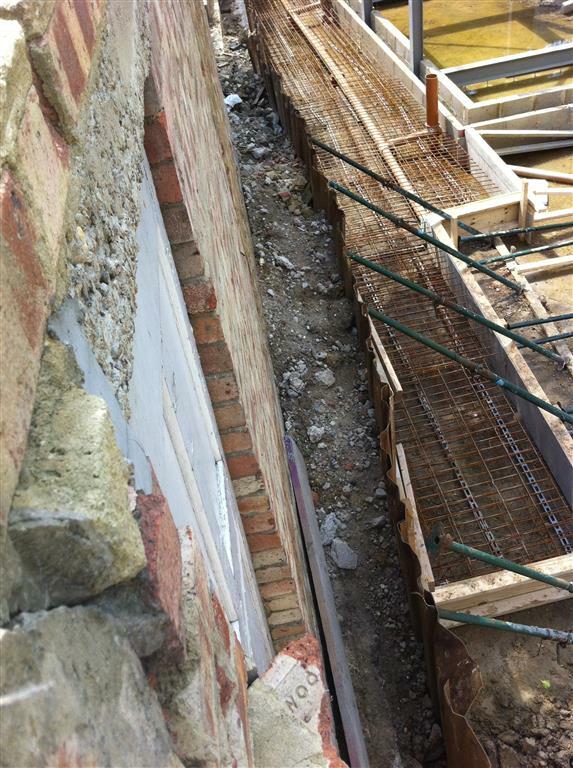 A few weeks ago – March 2015 – without prior notification and despite residents expressly telling them to leave their walls alone Hambridge Homes bricked up ALL their back garden wall doorways and placed brutally ugly grey concrete blocks capping on top of their walls. 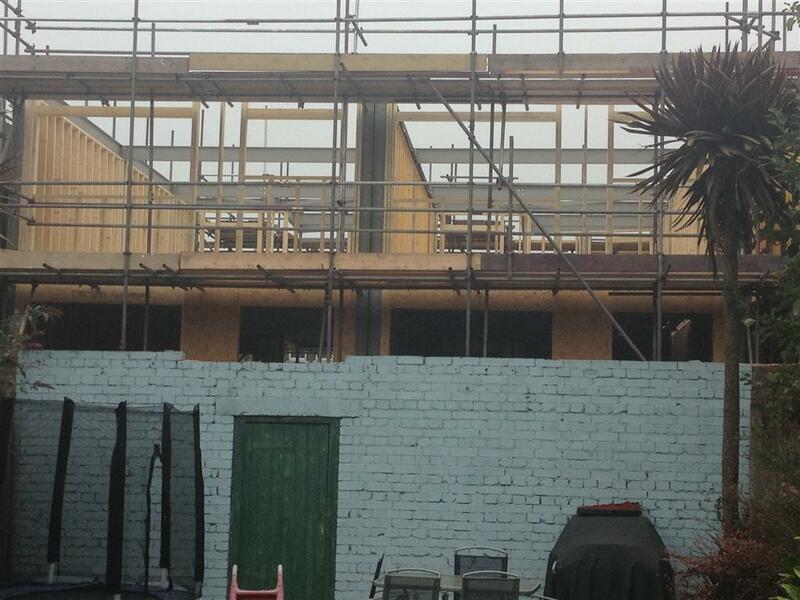 Not one of us on Wyatt Park Road, Daysbrook Road or Wavertree Road were contacted about Hambridge Homes plans. No notices were put up, no one received a letter and nothing was placed in the South London Press. 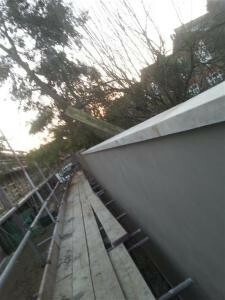 Although as a result of our complaint to the Local Government Ombudsman some ‘shady’ photos magically appeared. 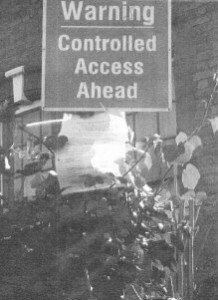 Prior to the Ombudsman enquiry Lambeth had been unable to produce any photographic evidence of lamp post notifications. (Chuka Umunna told us that ALL lamp posts locations can be identified by the numbers on them). Lambeth couldn’t provide any proof to us, or to the BBC investigation and we’ve even seen an email between 2 Lambeth planning employees stating they had no clue where such evidence might be found and yet miraculously an out of focus, without context, without date or time non-digital photo was ‘found’ for the ombudsman. Strange Lambeth couldn’t provide digital evidence as each year they issue over 200, 000 digital photos for the parking tickets they hand out. Just where did Lambeth find a non-digital camera as literally every single PCN has an accompanying digital photograph? Are Lambeth even allowed to take non digital photos as evidence and how would they be stored? Hambridge Homes currently have at least 46 ongoing developments in Lambeth alone. 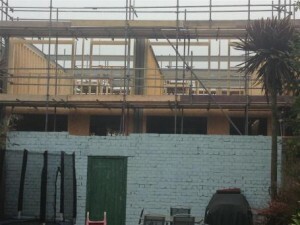 We say at least because 2 weeks ago we discovered Fawcett Close, an additional development i.e. one left off the list given to us in response to our FOI (Freedom Of Information) request asking how many other developments the Overtons had in Lambeth. We feel this to be the reason Lambeth illegally bulldozed planning permission through, plunge us into darkness, removed their children’s privacy, denied them their rights and knocked £50k off the price of their homes. We believe Lambeth did not inform us of their plans because they feared we’d oppose them, so instead opted to ignore legislation and guidelines and sneak things through and then lie about it. None of us were not informed so we did not get the opportunity to fully scrutinise the planned development. Do Lambeth really expect people to believe that we were ALL asleep at the wheel, that we ALL missed notices on lamp posts, would have ignored letters written to them by Lambeth council proposing a plan turning their homes into a dark prison and knocking £50k off their house value…? This is not a communist country where governments move people around, flatten villages and impose concrete blocks as they please. This is England, where we have rights! Lambeth illegally stripped us of our right to challenge their decision when they decided against making us aware of Hambridge Homes development plans. We contacted our local MP Chuka Umunna, who though happily traipses along to TV studios all over the country to seemingly speak on every political programme who asks. It took dozens of phonecalls, emails and constant badgering to persuade Mr. Umunna to walk a few metres down the road from his office to attend one of our meetings or visit the abhorrent site….? When he arrived he was visibly shocked at what we were expected to live with? We contacted Eric Pickles, Jeremy Clyne our then local councillor and Lambeth’s chief Executive Derick Anderson. We also contacted the newly elected councillors, Iain Simpson, Rezina Chowdhury and Liz Atkins, who made all the right noises prior to gaining office but once in ignored our emails. After an extremely protracted period of time we managed to get an extraordinarily incomplete response to our FOI. Literally no one is helping us. We are legally entitled to light under British law and privacy under European Human Rights legislation. 1 – Lambeth claimed to have sent 325 letters to people in the surrounding flats. Yet not one person in any of the houses on the roads surrounding the site received any notification. We know this for a fact because we literally knocked on EVERY SINGLE door on Daysbrook Road, Wyatt Park Road, Wavertree Road as well as the affected flats/houses on Streatham Hill. Not one person was notified via letter or saw any of the six notices Lambeth claim – retrospectively to have posted on lamp posts. There should be a mail merge available for inspection but ….no…? These roads comprise of a number of retired professionals and those raising families. Definitely not the sort of people to ignore something this significant that would so negatively impact on their lives. 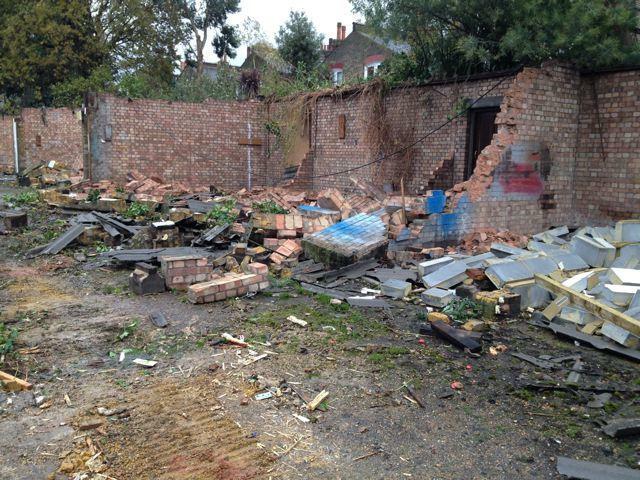 2 – Lambeth claim to have posted 6 notices in the area. Again not one person in any of the roads surrounding the development saw literally any of the notices they say they posted. Extremely odd, because as a community we make a point of talking about all the notices we see put up and have been quite alarmed at the fact that Lambeth have got into the habit of posting ‘retrospective’ notices. We’ve asked Lambeth for copies of the notices and to identify exactly where these notices were placed, they’ve declined to answer. 3 – Lambeth claim to have put a notification in the local press. We’ve asked the council to identify the date and the newspaper it was placed in. We’re still waiting for them to respond directly to this question. The unbearable noise from the Wavertree building site! This makes it impossible for anyone to be in their homes during the day. They’ve undoubtedly caused permanent structural damage to our houses. We’re literally centimetres away from the site and feel the foundations of our homes shake right through to our bones daily. We can feel our entire houses shaking in an extremely unnerving way – and possible permanent damage to the foundations of OUR homes?! Well enough’s enough on the 9th of April 2015 we took our grievances to the Royal Courts of Justice and as litigants in person submitted papers for a Judicial Review. The judge has got back to us saying she needs more information from Lambeth before deciding whether our case warrants a full Judicial review. Our situation could end up at the European Court of Human Rights! YOUR donations will enable us to fight this in court. If this can happen to us YOU might be next?! Please, please, please donate ideally at least £10 to our Fighting Council Corruption Fund. Councillors, MPs and the government has let us down. We’re hoping you’ll help right a Disgraceful Wrong!